Motivation is the fuel in the engine that moves us forward toward our goals. In the late 60’s Dr. Edwin Locke wrote a pioneering work called “Toward a Theory of Task Motivation and Incentives”. This paper represented the beginning of what would become known as Locke’s Goal Setting Theory. Now, over 50 years later, most of us cannot imagine a time when Goal Setting Theory (and the use of S.M.A.R.T. Goals) was not part of standard management practices. A key principle of Goal Setting Theory has to do with feedback. Positive feedback, such as that received when a goal is achieved, provides further internal incentive to achieve the next goal. 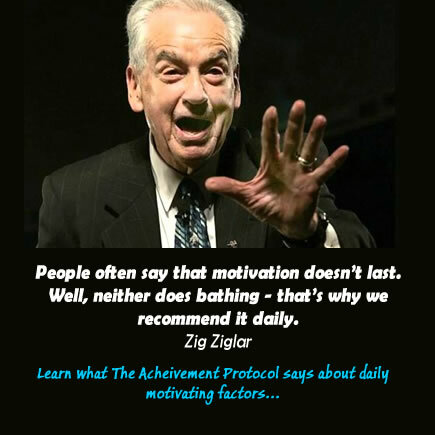 If we can break our goals down into bite sized chunks that can be accomplished daily or even multiple times throughout the day, then we keep our motivation fresh and are better able to maintain forward momentum. This is true as long as the goals are specific, measureable, attainable (while somewhat challenging), realistic and time-relevant. For example, having goals of making 6 sales calls before lunch and 4 sales calls after lunch, is much better than the goal of making as many sales calls as possible. Having small successes throughout the day and the week can provide us a constant drip of motivation, keeping performance up and moving us ever more effectively toward our Big Goals. And as Sir Arthur Helps said in 1868, “Nothing Succeeds like Success”.